Popular diets like Atkins diet, South Beach diet, GM diet, Blood type diet and Zone diet, have been analysed in these columns. There are several other diets that claim similar weight loss results. Most of the fad diets have similar goals of rapid weight loss with varied meal plans. 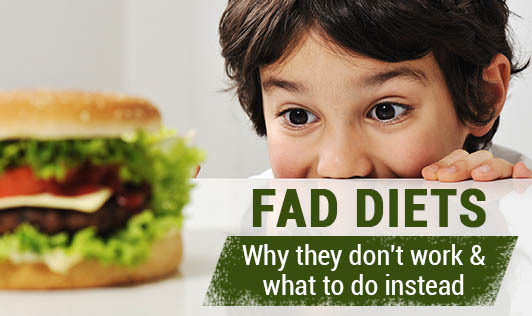 A fad diet is a weight loss plan that promises dramatic results. These diets don't offer long-term success, and they are usually not very healthy. The meal plans are not well balanced to provide all nutrients to the body, and at times supplements are prescribed to overcome the nutrient shortage. Some of the fad diets can actually be dangerous to your health. Most people are willing to try anything that promises to help them lose weight because they want to look better or feel better, or because they are worried about getting weight-related diseases. Companies, slimming centres or so-called experts that promote fad diets take advantage of this fact. They appeal to people by promising weight loss that's very quick and easy. People who dream of a`perfect' figure, prefer to try the quick fix of a fad diet instead of making the effort to lose weight through longterm changes in their eating and exercise habits. Fad diets also become popular because many of them do work for a short time. In many cases, this is because when you stop eating certain types of food or eat "special" combinations i of foods, you are getting fewer calories than you normally would. You are also paying more attention to what you are eating. However, it's likely that much of the weight you lose is from water and lean muscle, not body fat. Also, most people are not able to keep up with the demands of a diet that strictly limits their food choices or requires them to eat the same foods over and over again. People who use fad diets usually end up gaining back any weight that they lost.